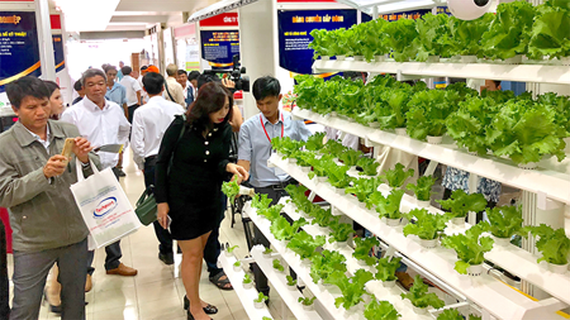 The 2018 Technology and Equipment Market (Techmart) themed ‘the cultivation, processing, and preservation of vegetables and fruits’ has been recently held by the Center for Science and Technology Information (CESTI). focusing on the new approach of delivering an ‘all-inclusive’ package of produce from farms to consumers using science and technology. More than 100 cutting edge technologies, devices, and solutions to deliver farm-to-table products with high nutrition and safety were introduced in Techmart 2018. One worth mentioning is the model of growing vegetables using hydroponics of VHF Trading Production Co. Ltd. It is highly versatile and able to be applied in limited space of private households, farms, or professional gardens. It can guarantee the sanitation and safety level thanks to the observation of all rules in tending, growing, and controlling the water source, the temperature, the air around the cultivated area. Another noticeable one is the device Airocide to preserve produce presented by Viet My Instrument and Technology Joint Stock Co. It can eliminate nearly 100 percent of bacteria, viruses, fungi, ethylene, which usually spoil produce and food. This will guarantee the length of freshness and the natural color of all produce without the use of chemicals. The Ho Chi Minh City Institute of Physics introduced equipment researched and developed by the institute itself. These pieces are in the fields of electronics and applied physics, such as a moisture meter, a thermometer, a device to prevent calcifying and rust, a machine to detect wood and metal. Other impressive solutions are the formal presentation of an organic process to grow mushroom in accordance with VietGAP standard; the use of smart monitoring and energy in produce processing in Industry 4.0 with the help of cloud computing; the strict course of quality control of air in harvesting, processing, and preserving produce; the machinery to provide pasteurized water in processing and preserving vegetables and fruits; the oil-extracting technology to increase the value of produce. 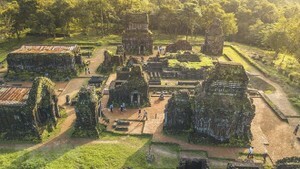 According to Ms. Bui Thanh Hang, Director of CESTI, this year, the organization board especially focuses on all-inclusive-packaged solutions and the implementation of new technologies in growing and processing produce or the smart monitoring devices and the application of solar energy in manufacturing to reduce expense cost. Techmart, as said by Ms. Bui Thanh Hang, is an event to support researchers and businesses to launch their technological products. It is also the place for the exchange and consultation between small and middle-scaled companies, fostering the innovation and implementation of new technologies in production. CESTI also operate the website Techport.vn, which is a digital information portal for innovation and technology transfer. It regularly update knowledge and data for nearly 4,000 new devices and technologies. All businesses can upload their current machines or link their website address via a provided account. In 2018, Techport.vn is going to add a forum feature so that suppliers and companies can easily and quickly exchange information. Techport.vn is developed based on an open mechanism in order for all organizations and individuals buying or selling products, technologies, inventions and seeking trading opportunities to register and operate smoothly on the system. Therefore, Techport.vn is identified as an online channel of the technology trading floor in Ho Chi Minh City to connect businesses with suppliers, consultation and financial organizations, the network of professionals, international startup communities. To better foster the innovation and technology transfer activities, since 2016, CESTI has actively invested into upgrading the information system of Techport with three main functions of technology trading, technology transfer consultation, and partner seeking. With this upgrade, in 2017, the portal received 380 requests of technology and equipment from organizations and companies via seminars and Techmart; providing information for 299 requests; passing 81 requests to corresponding consultants. Until now, Techport.vn has 2,890 technologies and equipment, 407 suppliers, 715 consultation organizations, 87 projects on the way to seek partners. This has shown its usefulness in approaching the technology market. According to Ms. Bui Thanh Hang, Techport.vn aims at attracting 2,000 members with more than 5,000 scientific and technological products, inventions, or projects in 2018. Techmart 2018 was able to connect and deliver consultation for over 50 businesses while receiving nearly 300 requests of information provision.